Ron is right on target about the need to have life jackets for your boating dogs. Many think all dogs are natural swimmers. While they probably all will naturally “dog paddle,” many dogs are not good swimmers. Even those that are can get tired in a long swim, get injured in an upset and be overwhelmed by current or rapids. Even a champion swimmer like U.S. Olympic Gold Medalist Michael Phelps could be overmatched in those conditions, without the assistance of a life jacket. And just like us, their natural buoyancy depends on their body composition. Muscle tissue has less buoyancy than fatty tissue. Some lean, muscular dogs struggle to stay afloat. 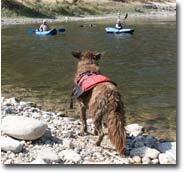 Just as the life jacket, or Personal Flotation Device (PFD), is the single most important safety article for people, so it is for our canine companions. There are a number of them on the market. We make an excellent one, the NRS Canine Flotation Device (CFD). We’ve sold it since 2002, and tens of thousands of them are protecting dogs all over the world. Auburn taking it easy on the Salmon River, ID. Important features to look for in a dog life jacket are sufficient flotation, adjustability for the many different body shapes, rugged attachment hardware, durable covering material, a leash attachment point and a sturdy grab handle. Some jackets wrap the flotation, or at least extend the fabric, around the dog’s body. We’ve found that this extra covering can lead to overheating during hot weather. Durable materials and rugged construction are important for these active animals. A grab handle is essential for lifting your dog into the boat and holding on to them at times. One important safety note, never tie your dog onto the boat, at least in any condition that could lead to a boat upset. You enjoy being outdoors with your dog and want to take them with you when you go out on the water. Just remember, your dog may not be as crazy about boating as you are. Some dogs, like the retriever breeds, naturally take to the water; however, they may find that bouncing around in a boat is not to their liking. Other dogs don’t like being in the water and will swim only if forced into it. Gently introduce your dog to the water and boating. Put their life jacket on them at home and let them get used to wearing it. First, take them out in your boat for short jaunts. 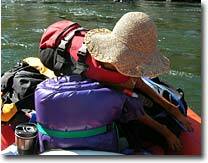 Don’t make their first outing a multiday trip; it might be a miserable experience for both of you. Don’t force the dog to swim; even dogs that don’t like the water can learn to enjoy (or at least adapt to) being on the boat and the freedom of camp. Sometimes giving treats can help reinforce positive behavior. A wide mouth water bottle is a great place for storing treats, keeping them dry and close at hand. You love your pet; just don’t expect your boating companions to feel the same way about your dog. Check with others before bringing your dog on a trip. It’s up to you to monitor and moderate their behavior. Bring along plenty of bags for picking up their feces; deposit it in your toilet or in the trash. Prevent your pet from chasing or harassing wildlife or bothering other campers. Make sure they drink plenty of water. Some owners try to get them to drink fresh water, fearing parasites or pollutants in the waters they’re boating in. Stop often enough during the day for them to relieve themselves. Rough rock and sharp sand and gravel can irritate and injure paws. There are numerous products advertised for toughening and healing paws that might be worth a try. Dogs can tear a toenail while scrambling around on a boat; treat the torn nail like you would any open wound. from eating a rotten fish she found. Some short-haired, light-skinned dogs can sunburn; use SPF 15 or higher sunscreens on exposed areas. Thorns and cheat grass awns can get into dogs’ paws, ears and noses. Bring along some tweezers or forceps for removing them. And if you’re in porcupine country, by all means bring along these tools; you might need pliers. If your dog gets in an argument with a skunk – good luck. Nose Plugs? For your health, in areas with poison oak/ivy/sumac be aware that the irritant plant oils can transfer from the dog’s coat to you when you handle them. If you’re allergic, the only thing you can do is bathe the dog, with soapy water (well away from any water source), after they’ve been running through this vegetation. Boating with your dog can be a great experience…or it can be a disaster. Like some people, some dogs just don’t make good boating companions. Do your best to introduce them to your favorite pastime; then if they just don’t take to it, leave them at home. You’ll both be happier.